Sutton was born at Vandenberg Air Force Base near Lompoc, California to parents David and Wendy.Her father is an Air Force officer who was in the Pentagon at the time of the September 11 attacks. Sutton later moved to California, away from her family's home in Virginia, to train and live with a host family.As of 2008, Sutton was taking high school classes through the University of Nebraska Independent Study Program. 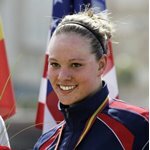 Sutton was the champion in the women's 10 kilometer open water swim at the 2007 Pan American Games. Sutton qualified for the 2008 Summer Olympics in Beijing at the test event in Beijing.At the Olympics, Sutton finished in twenty-second place with a time of 2:02:13.6.